El diagnóstico diferencial de una lesión intra -articular en la rodilla de un paciente pediátrico es amplio. Consideraciones de diagnóstico incluyen sinovitis vellonodular pigmentada ( SVP ) – la más común de tumor – e intra -articular de una variedad de tumores tanto benignos como malignos , incluyendo lipomas, hemangiopericitomas , fascitis nodular , osteosarcomas y sarcomas parosteal , fibromixoide . Si hay preocupación por posibles lesiones malignas , un cirujano del tumor debe ser consultado. Diagnóstico patológico exacto es ideal para identificar estas lesiones enigmáticos y para determinar el plan de tratamiento adecuado . En este artículo se presenta el caso de un niño de 13 años de edad que presentó con una duración de 1 mes de dolor en la rodilla y sin antecedentes de traumatismo en la extremidad. El examen físico reveló dolor en la línea articular medial y lateral , dolor con el rango de movimiento , y el rango limitado de movimiento de la rodilla afectada. La resonancia magnética reveló un 3 × 1 × 3 cm de la lesión en la esquina posterolateral que se cree que está localizada la SVP . Artroscópica , no había pruebas de la SVP , pero una masa de tejido suave posterolateral se encontró y se retira , que fue diagnosticado patológicamente como una rara , benigna , intra-articular, fascitis nodular . 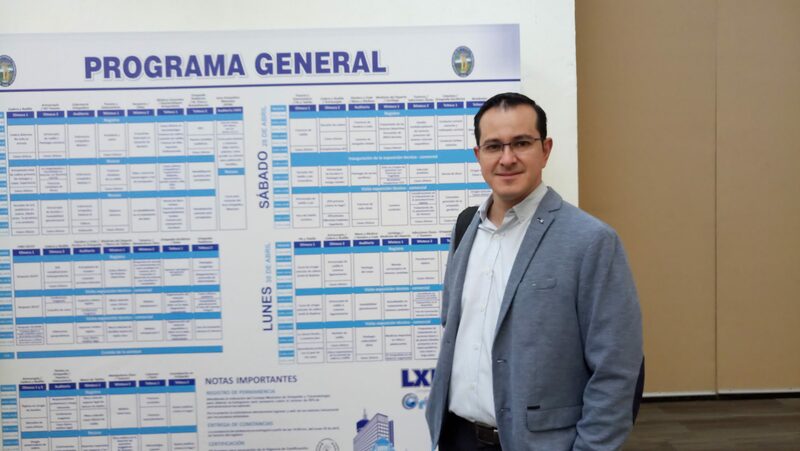 Cuando se trabaja con masas intraarticulares , es importante para evaluar la probabilidad de malignidad y tanto consultar a un cirujano tumor y utilizar los principios de tumores quirúrgicos apropiados cuando la malignidad es una preocupación. Además , el equipo de patología debe ser consultado antes de la cirugía y estar en estado de alerta durante la evaluación artroscópica de la rodilla para ayudar con el diagnóstico preciso de la masa intra -articular . Al discutir el caso con el patólogo con estudios de imagen actuales es útil ya menudo ayuda en el diagnóstico de la lesión. The differential diagnosis for an intra-articular lesion in the knee of a pediatric patient is broad. Diagnostic considerations include pigmented villonodular synovitis (PVNS)—the most common intra-articular tumor—and a variety of both benign and malignant tumors, including lipomas, hemangiopericytomas, nodular fasciitis, parosteal osteosarcomas, and fibromyxoid sarcomas. If there is concern over possible malignant lesions, a tumor surgeon should be consulted. Precise pathologic diagnosis is ideal for identifying these enigmatic lesions and for determining the appropriate treatment plan. This article presents the case of a 13-year-old boy who presented with 1-month duration of knee pain and no history of trauma to the extremity. Physical examination revealed pain along the medial and lateral joint lines, pain with range of motion, and limited range of motion of the affected knee. Magnetic resonance imaging revealed a 3×1×3-cm lesion in the posterolateral corner that was believed to be localized PVNS. Arthroscopically, there was no evidence of PVNS, but a posterolateral soft tissue mass was found and removed, which was pathologically diagnosed as a rare, benign, intra-articular nodular fasciitis. When working with intra-articular masses, it is important to assess the likelihood of malignancy and to both consult a tumor surgeon and use the appropriate surgical tumor principles when malignancy is a concern. Additionally, the pathology team should be consulted prior to surgery and be on standby during arthroscopic evaluation of the knee to help with precise diagnosis of the intra-articular mass. Discussing the case with the pathologist with imaging studies present is helpful and often aids in the diagnosis of the lesion. The authors are from the Department of Orthopaedics (IG, MJM, LW) and the Department of Pathology (KRC), Children’s Hospital of Philadelphia, Philadelphia, Pennsylvania. Correspondence should be addressed to: Lawrence Wells, MD, Department of Orthopaedics Children’s Hospital of Philadelphia, 34th & Civic Center Blvd, Philadelphia, PA 19104 ( wellsl@email.chop.edu). There are a variety of intra-articular knee lesions in the pediatric population. Mechanical symptoms of the knee (snapping, locking, popping, giving way, localized tenderness, and pain) are most commonly associated with meniscal tears, chondral injuries, and loose bodies; however, in rare cases, intra-articular tumors, benign or malignant, can occur, with localized pigmented villonodular synovitis (PVNS) being the most common of these lesions.1 Localized PVNS has been known to mimic other intra-articular lesions, such as meniscal pathology or loose bodies. The use of arthroscopy in the pediatric population is increasing, with rates rising by 62% between 1996 and 2006, with most of this increase being attributed to knee and shoulder arthroscopy.2 A recent retrospective review found that approximately 0.8% of individuals seeking arthroscopic surgery for mechanical knee symptoms had benign intra-articular masses. This article presents the case of a young boy who presented with mechanical knee symptoms and was believed to have PVNS based on magnetic resonance imaging (MRI). Intraoperatively, there were no signs of PVNS, and pathologic analysis revealed a rare intra-articular mass. A 13-year-old boy presented with left knee pain of 1 month’s duration, which had prevented him from playing baseball, and no history of trauma to the extremity. He reported anterior knee pain that worsened with knee extension to a straight leg position, swelling, and decreased range of motion. He reported no rashes, tick bites, mechanical symptoms, fever, paresthesias, warmth, open wounds, or febrile illness. No joints other than the left knee were symptomatic, and there was no family history of juvenile rheumatoid arthritis. Prior to presentation, laboratory tests ruled out Lyme disease. Ibuprofen, rest, and ice had been ineffective in treating the pain. On physical examination, the patient was afebrile, with an antalgic gait. He had a moderate effusion of the left knee, and his knee was tender to palpation along the medial and lateral joint line as well as the lateral femoral condyle. He had normal strength without crepitus on range of motion and normal findings on distal neuro-vascular examination. Pain was elicited with range of motion. Active range of motion was 15° to 95° for the left knee, compared with 0° to 140° for the unaffected right knee. Radiographs revealed a joint effusion without evidence of fracture, osseous abnormality, periosteal reaction, or foreign body. Magnetic resonance imaging (MRI) was performed to further evaluate possible intra-articular derangements. Magnetic resonance imaging revealed a 2.8×1.0×3.4-cm lesion posterior to the lateral femoral condyle. The lesion was mildly hyperintense on T1-weighted MRI and mildly hypointense on T2-weighted images (Figure 1), with signal characteristics most consistent with localized PVNS. Once informed consent was obtained, the patient was scheduled for surgical arthroscopy and debridement of the left knee with biopsy. Magnetic resonance imaging depicting intra-articular nodular fasciitis. Axial T2-weighted (A), sagittal T2-weighted (B), and sagittal T1-weighted (C) images. On arthroscopy, an initial view of the knee through an anterolateral portal revealed moderate synovitis in the patellar fat pad, which was debrided. There was a discrete soft tissue mass directly posterior to the lateral femoral condyle extending distally into the popliteal hiatus (Figure 2), inhibiting range of motion of the knee. No gross clinical evidence of PVNS was noted. Frozen sections from multiple intraoperative biopsies revealed spindle cell proliferation set in myxoid or chondroid matrix. An accessory posterolateral portal was established under direct visualization to perform an extensive synovial debulking of all visibly involved tissue. Arthroscopic image looking posterolateral from anteriomedial (A) and closeup image from the posterolateral portal (B) depicting the location of the intra-articular nodular fasciitis lesion. The final pathology report revealed a benign spindle cell proliferation with haphazard arrangement and foci of short interlacing fascicles. Foci of myxoid degeneration and extravasation of erythrocytes were noted. Neither hemosidern pigment nor clusters of foamy macrophages were identified. The lesional cells were positive for vimentin, smooth muscle actin, muscle specific actin, and CD10. No reactivity was seen with CD34, bcl-2, desmin, S-100, and cytokeratin AE1/AE3 (Figure 3). 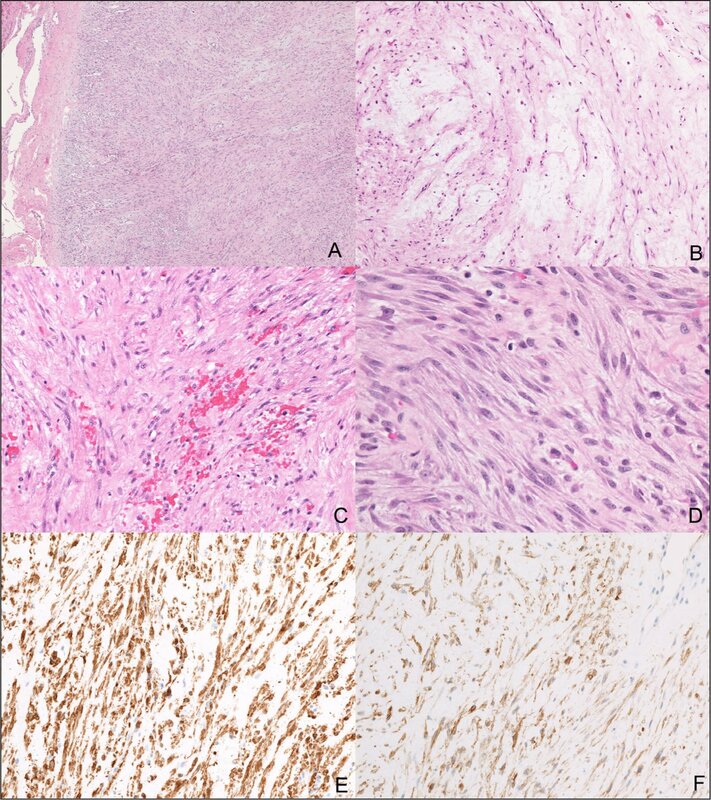 These histological findings and immunohistochemical staining properties were consistent with nodular fasciitis. Fluorescent in situ hybridization studies for fused in sarcoma gene break apart yielded negative results and MUC-4 immunostaining revealed only scattered positive cells, making a diagnosis of fibromyxoid sarcoma unlikely. Pathologic images of the frozen sections from multiple intra-articular biopsies of the lesion. Low-magnification (hematoxylin and eosin, original magnification ×40) image of the unencapsulated, but well-circumscribed, subsynovial tumor (A). Focal myxoid degeneration (hematoxylin and eosin, original magnification ×200) (B). Extravasation of red blood cells (hematoxylin and eosin, original magnification ×200) (C). High-magnification (hematoxylin and eosin, original magnification ×400) image showing lesional cells with monomorphic elongated hyperchromatic nuclei (D). Strong and diffuse reactivity with smooth muscle actin (original magnification ×200) (E). Diffuse reactivity with CD10 (original magnification ×200) (F). After ruling out common intra-articular lesions such as PVNS, the authors relied on the expertise of pathologists to determine the type of intra-articular lesion encountered. Based on the initial frozen section review, the pathologic differential diagnosis included PVNS, parosteal osteosarcoma, fibromyxoid sarcoma, nodular fasciitis, and malignant hemangiopericytoma. On MRI, nodular fasciitis has a signal intensity similar to, or slightly higher than, skeletal muscle. It usually is homogeneous on T1-weighted images with high signal intensity on T2-weighted sequences, greater than subcutaneous fat. At times, however, it may demonstrate intermediate signal intensity.4 Thus, it is difficult to make a definitive diagnosis on MRI and pathologic review is necessary. Although the authors acknowledge that classic tumor principles stress the use of longitudinal incision without violation of multiple compartments, in this situation the lesion was intra-articular with exposure to both the proximal tibia and the distal femur. When PVNS was not encountered on diagnostic arthroscopy, an intraoperative decision was made by the senior author (L.W. ), given the lower likelihood of malignancy based on advanced imaging, to access and excise the lesion arthroscopically with the use of an additional posterolateral portal. Although the possibility of seeding another portal tract was introduced, in the event of malignancy, the definitive procedure would involve either wide excision with a limb-sparing procedure or an above the knee amputation. Both would address whatever seeding occurred during the less invasive arthroscopic procedure. The differential diagnosis for an intra-articular lesion in the knee of a pediatric patient is broad. If concern exists about possible malignant lesions, a tumor surgeon should be consulted. The pathology team should be consulted prior to surgery and be on standby during arthroscopic evaluation of the knee to help with the diagnosis. Discussing the case with the pathologist with the imaging studies present is helpful, often aiding in diagnosis of the lesion. McKay S, Chen C, May M, Zhang W. Increase in outpatient arthroscopy in the pediatric population (<18). Presented at The Pediatric Orthopaedic Society of North America Annual Meeting. ; May 1–4, 2014. ; Toronto, Ontario, Canada. .
Kransdorf M, Murphey M. Imaging of Soft Tissue Tumors. 2nd ed. Philadelphia, PA: Lippincott Williams & Wilkins; 2006. Dönmez FY, Tüzün U, Başaran C, Tunaci M, Bilgiç B, Acunaş G. MRI findings in parosteal osteosarcoma: correlation with histopathology. Diagn Interv Radiol. 2008; 14(3):142–152.